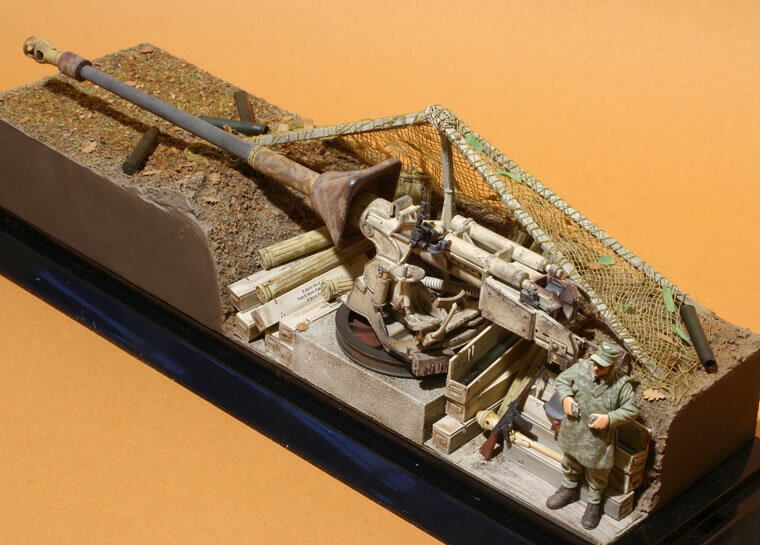 The kit manufacturers have been getting really desperate for late-war German releases, and Dragon's recent 8.8cm PaK 43/3 is a good example. I suspect that most modelers will have a difficult time finding any references at all on this gun. I got interested in the project while doing research at the National Archives for an Osprey Fortress book on the German defense lines in the west in 1944-45, the West-Stellung. These guns were designed specifically for this program, so the files contained quite a bit of detail. Basically, the program was intended to emplace 500 88mm guns in a PaK Front behind the main-line-of-resistance to stop Allied tank penetrations. Rather than waste expensive guns on the usual wheeled tactical mounts, the plan was to expend surplus tank guns that were left over after Allied bombing raids cut AFV production in the late summer and early autumn of 1944. The Jagdpanther KwK 43/3 was the primary weapon used in this project, with two orders, the first for 250 guns (1.Serie) and the second for 200 guns (2.serie). At first, the guns were mounted on a concrete pad (Betonfundament). Ideally they were supposed to be deployed in special Regelbau Nr. 703 reinforced concrete bunkers, but in the event, only 8 were deployed in this fashion in the Netherlands. The rest ended up in simple open gun pits. The final batch of 150 guns from 2.Serie were ordered with the Behelfskreuzelafette (Improvised cruciform mount). Most of the photos I've found in the US archives were the original configuration on the concrete pad, so I decided to build my model in this configuration. By the way, the kit provides a very nice Sd.Ahn. 202 limber set, but from what I've seen, this was not issued with the guns, which were specifically earmarked for static Festung-PaK-Verband, and not normal anti-tank units. I built the kit pretty much out-of-the-box. I made two slight changes, the addition of the 120kg counter-weight on the front of the barrel, and the addition of the 12 volt battery for the firing circuit under the gunner's seat. The documents make it quite clear that the guns were delivered in components and assembled in depots or in the field. So this was an excuse to paint it in various colors including the ivory interior AFV color for the main gun assembly, red lead primer for the mantlet and counter-weight, heat-resistent grey for the barrel and dark yellow for other bits. 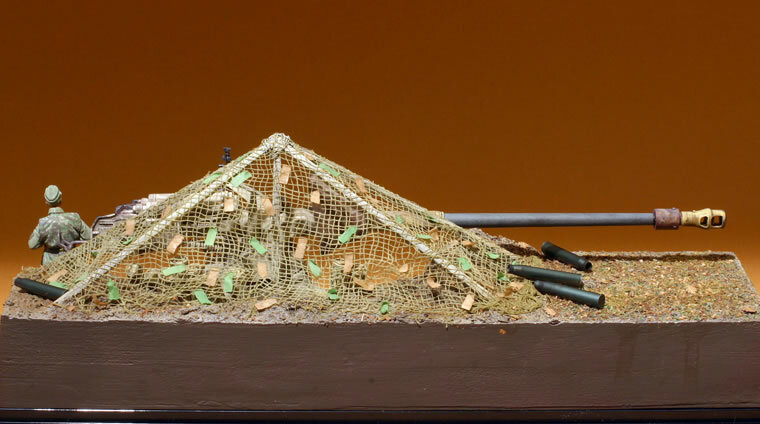 The ammo comes from two AFV Club sets, the basic plastic set for the ammo tubes and boxes, and the turned metal set for the anodized casings. The figure is a resin item from the Wolf series. The vignette base was carved from Balsa Foam and the ground texture is from acrylic wood putty and Liquitex acrylic texture gels. 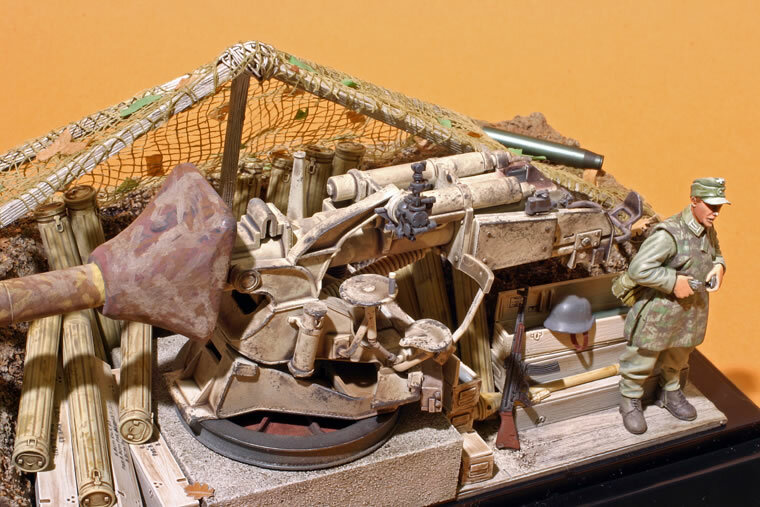 The camouflage tent is from Evergreen strip scraped with a razor saw for wood grain, and the camouflage net is a home brew of gauze dyed with acrylic paint with the usual German artillery garnish of green and brown paper. The Dragon kit went together quite well, and the resulting model as an interesting and off-beat subject. More details will follow in a Military Modelling article including historical photos.